A Cultural Medallion Award winner in 2003, Lim Tze Peng (b.1921 -) has been writing and painting for over five decades. Though largely self-taught in art, he has amassed a diverse portfolio that traverses various mediums, and is most known for his nostalgic ink compositions of Old Singapore scenes as well as highly stylised series of Chinese calligraphy. 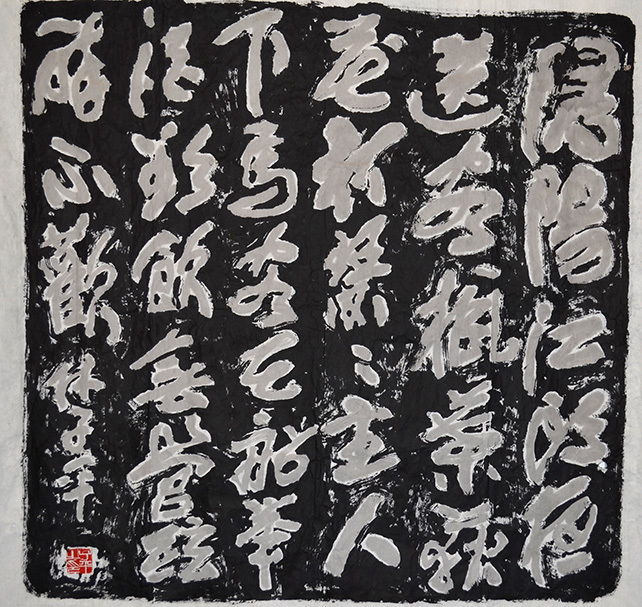 Having taken the bold aesthetic turn towards abstraction, Tze Peng continues to build the momentum for his “Muddled Writing” (originally self-termed by the artist as “糊涂字”: hu tu zi) –an innovative series that first came to the fore in 2008 and subsequently travelled for show at the prestigious National Art Museum of China in Beijing and the Liu Hai Su Museum in Shanghai. In recent years, Tze Peng has also devised another creative string of calligraphic expressions spotting the uncommon yet organic incorporations of colour pigments to much critical appraise. This growing body of calligraphic work pushes the boundaries for a centuries-old tradition and bridges the divide between painting and calligraphy, offering a new paradigm for contemplating Chinese ink aesthetics.